Not to be confused with Dictionary of Australian Biography. The ADB project should not be confused with the much smaller and older Dictionary of Australian Biography by Percival Serle, first published in 1949, nor with the German Allgemeine Deutsche Biographie (published 1875–1912) which may also be referred to as ADB in English sources. To date, the ADB has produced eighteen hard copy volumes of biographical articles on important and representative figures in Australian history, published by Melbourne University Press. In addition to publishing these works, the ADB makes its primary research material available to the academic community and the public. On 6 July 2006, the Australian Dictionary of Biography Online was launched by Michael Jeffery, Governor-General of Australia, and received a Manning Clark National Cultural Award in December 2006. The website is a joint production of the ADB and the Australian Science and Technology Heritage Centre, University of Melbourne (Austehc). In 2018, Clinton Fernandes wrote that ADB is conspicuously silent on the slaveholder or slave profiting pasts of a number of influential figures in the development of Australia, including George Fife Angas, Isaac Currie, Archibald Paull Burt, Charles Edward Bright, Alexander Kenneth Mackenzie, Robert Allwood, Lachlan Macquarie, Donald Charles Cameron, John Buhot, John Belisario, Alfred Langhorne, John Samuel August, and Godfrey Downes Carter. However, the Legacies database from which Fernandes obtains this information is ambiguous as to George Fife Angas's connection with slavery. It states that he did not lodge the claims himself but collected the compensatory amount for unknown reasons. The entries were written in the 1960s and await to be updated. ^ "About Us". 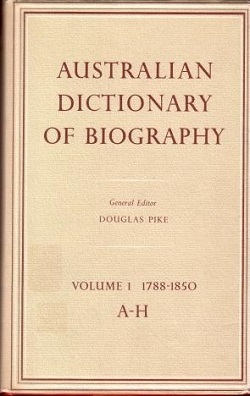 Australian Dictionary of Biography. Australian National University. ^ Allbrook, Malcolm. "Indigenous lives, the 'cult of forgetfulness' and the Australian Dictionary of Biography". The Conversation. Retrieved 20 January 2018. ^ "Allgemeine Deutsche Biographie +ADB - Google Search". Google. ^ "Launch of Online Edition of the ADB". ^ Fernandes, C. Island Off the Coast of Asia: Instruments of statecraft in Australian foreign policy (Melbourne: Monash University Publishing, 2018), 13-15. ^ Daley, Paul (21 September 2018). "Colonial Australia's foundation is stained with the profits of British slavery". The Guardian. Retrieved 4 April 2019. ^ "Summary of Individual - Legacies of British Slave-ownership". www.ucl.ac.uk. Nolan, Melanie; Fernon, Christine (2013). The ADB's Story. Canberra: Australian National University. ISBN 978-1-925021-20-2.